Legal Status: Atlantean king with diplomatic immunity. Skills and abilities: Exceptionally gifted hand to hand combatant. Powers: He has superhuman stamina, durability, agility and speed, but his powers slowly decrease as he spends time out of the water. He can survive indefinitely in water or on land, and is able to withstand all pressure and cold in the sea. He has the durability to withstand the pressure of the depths of the ocean, extreme heat temperatures, and sonic attacks. He can swim at torpedo-like speeds and has an extended lifespan. His skin is very resistant to physical damage though he’s not invulnerable but can resist bullet fire and is fireproof. Namor also has wings on his ankles which allow flight at superhuman speeds and maneuverability. Lastly he is one of the strongest earth based heroes who can lift well in excess of 100 tons putting him in the same strength class as Hulk, Superman, Icon, Blue Marvel and Thor. His strength and power increases when submerged in water. Born in a world where his father was African American as opposed to Caucasian he has the same past as 616 Namor except he became king of Atlantis at an earlier stage. He rescued Susan Storm from certain death after her spaceship had been bombarded by cosmic rays and battered by asteroids and all her crew mates were killed. This event marked the death of 3 billion people as the asteroids smashed the south Americas into islands, destroyed the Caribbean, destroyed Japan and destroyed England. The other meteors that didn’t make land fall created a series of Tsunami’s which further remade the world. Africa was left the only real super power which was divided by Storm and the Villainous Black Panther. The rest of earth and the expanded sea became the realm of Namor and Atlantis. Susan and Namor eventually grew to love each other wed, producing many children.He also became friends with Remy Lebeau.Gambit of the X-men, who eventually died in battle, he would name his first son after him. The atlantean rebels allied with the Black Panther and her armies in hopes of dethroning Namor. This is how he met the reality hopping Exiles whom his son eventually joined. In his son’s absence he was killed by the evil Black Panther. His son Remy would succeed him as king. I love the art work and other than blue,a black man is a perfect Namor however why remake already established HEROS black ? Why not just make another lost underwater city like Oceanous or something and all the citizens are black.i mean they had their run let them go to the big screen or fade out so that creators can create ! and the oceans so big! 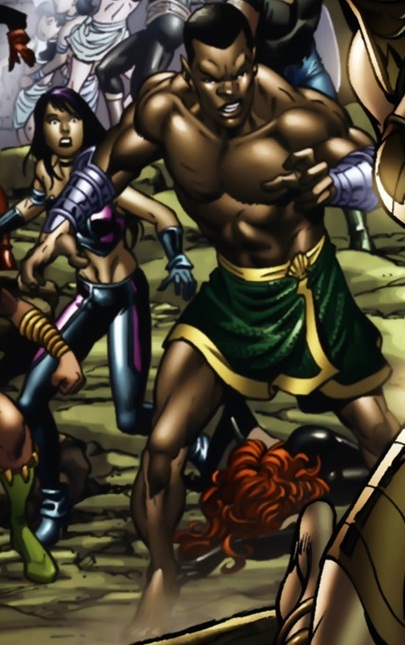 Was Namor really black, or was he fan made. This is Namor from another dimension Static. The original is white. thanks man. You are awesome.